Former Interior Department Secretary and Colorado Attorney General Ken Salazar said the proposed oil and gas leases near the Great Sand Dunes National Park are “on the other side of the mountains”, not within park boundaries, and called the proposed 2,500-foot setback in Initiative 97 “unconstitutional” in comments Thursday. 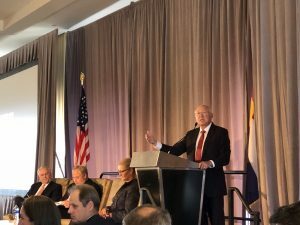 Salazar was joined by U.S. Deputy Secretary of the Interior David Bernhardt and American Petroleum Institute President & CEO Jack Gerard at the Colorado Petroleum Council luncheon in Denver. Salazar, a native of the San Luis Valley where the Great Sand Dunes National Park is located, said media and ideological agendas were driving a narrative that the proposed oil and gas lease parcels by Bureau of Land Management were inside the park, which he said was incorrect. “It’s a very special place for me. But I think this controversy here in terms of drilling in the so-called Great Sand Dunes goes exactly to the point that Jack Gerard was just making: the importance for us to be able to represent, to distinguish the difference between facts and myth,” Salazar said. Of the 18,358 total acres in the parcels currently being reviewed, only 1,247 acres of the surface lands are BLM maintained, with the remainder of surface land, 93.2 percent, being privately owned. “I oppose drilling within the Great Sand Dunes National Park. But if you’re from the valley like I am, you know that to get to the place that is potentially going to be—it’s still being studied for potential drilling—it’s way on the other side of the mountains. It’s on this side of the Sangre de Cristos,” Salazar said, indicating a great distance. “It’s near the town of Westcliffe. It might as well be, for us in the San Luis Valley, as far as Moffat,” he said, pointing to a city northwest of the park. “And yet, somehow, if you look at the media reports, it’s about drilling within the Great Sand Dunes National Park. It is not,” Salazar continued. “And so one of the realities that I think is really important for all of us to get to be literate about energy, so we understand energy issues, but also to know what the facts are, because sometimes people will misstate the facts in order to advance a particular agenda,” he added. “In this particular case, there is nobody that I know of that is proposing drilling for oil and gas within the boundaries of the Great Sand Dunes National Park,” Salazar argued. Salazar was proud of his deep historical roots in the valley, which he said gave him first-hand experience with the importance of energy in improving the economy and way of life. Salazar said he still has the pen used by President Bill Clinton to sign the legislation authorizing the park. He also pushed back on a proposed ballot measure that would take the vast majority of Colorado’s non-federal lands off the table for new oil and gas development. Salazar characterized the proposal as impractical. “We have to come up with practical solutions that aren’t way off the map in the way the 2,500-foot setback proposal is,” he continued. Salazar’s comments revealed deep divisions within his own Democratic party over issues like hydraulic fracturing, oil and gas permitting, and the benefits of energy production within the state. Salazar told Western Wire that “facts and science” should be prioritized over debating the merits of issues like setbacks, particularly if that debate is littered with misinformation or driven purely by ideology. “So I think the debate and dialogue is important, but I think at the end of the day, having our leaders making informed decisions is what’s most important here,” Salazar said. “It’s no secret John Hickenlooper and Jared Polis are opposed to the setback initiative, but it’s a debate that’s going to continue one way or another, and it’s important to have energy literacy and for people to really understand how all this works so that decisions are based on facts and science and not on some ideology,” he added. Gerard agreed that over issues like Initiative 97, the party leaders and rank-and-file Democrats, including many activists, are at odds with one another. “The vast majority of the Democratic leaders in this state are opposed to that initiative, so I think you’ve got a disconnect between many of the current leaders and the party itself,” Gerard said. “A proposal to create a setback that essentially puts 80 percent of the energy opportunity in the state off-limits, I don’t think the vast majority of this state will tolerate that,” he continued, adding that the real support for the measure come from those who want to “slow or stop” oil and gas production altogether. A July Colorado Oil and Gas Conservation Commission study found that more than 85 percent of the state’s non-federal lands would be put off limits to any new oil and gas development if Initiative 97 were to pass in November. Proponents of the measure have until August 6 to gather more than 98,000 valid signatures to put the setback proposal on the midterm ballot.